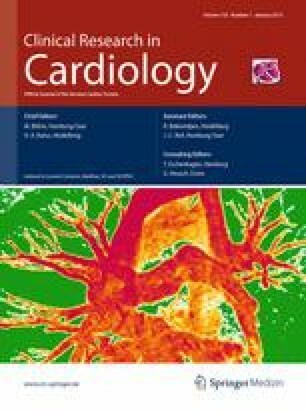 Cell therapy (CTh) is a promising novel therapy for myocardial infarction (MI) and ischemic cardiomyopathy (iCMP). Recognizing adverse events (AE) is important for safety evaluation, harm prevention and may aid in the design of future trials. To define the prevalence of periprocedural AE in CTh trials in MI and iCMP. A literature search was conducted using the MEDLINE database from January 1990 to October 2010. Controlled clinical trials that compared CTh with standard treatment in the setting of MI and/or iCMP were selected. AE related to CTh were analyzed. A total of 2,472 patients from 35 trials were included. There were 26 trials including 1,796 patients that used CTh in MI and 9 trials including 676 patients that used CTh in iCMP. Periprocedural arrhythmia monitoring protocols were heterogeneous and follow-up was short in most of the trials. In MI trials, the incidence of periprocedural adverse events (AE) related to intracoronary cell transplantation was 7.5 % (95 % CI 6.04–8.96 %). AE related to granulocyte colony-stimulating factor (GCS-F) used for cell mobilization for peripheral apheresis was 16 % (95 % CI 9.44–22.56 %). During intracoronary transplantation in iCMP, the incidence of periprocedural AE incidence was 2.6 % (95 % CI 0.53–4.67 %). There were no AE reported during transepicardial transplantation and AE were rare during transendocardial transplantation. The majority of periprocedural AE in CTh trials in MI occurred during intracoronary transplantation and GCS-F administration. In iCMP, periprocedural AE were uncommon. Avoiding intracoronary route for CTh implantation may decrease the burden of periprocedural AE. Standardization of AE definition in CTh trials is needed.